Let me begin by saying say I am honored to have received a response from N.T. Wright in Christianity Today last month. He is a giant and he has probably influenced me more than any other living theologian (yes, even more than Ratzinger/Benedict XVI). At the risk of sounding presumptuous, I would like to engage some of N.T. Wright’s comments made in the context of his response to me in the recent Christianity Today article: “Not All Evangelicals and Catholics Together: Protestant debate on justification is reigniting questions about Rome.” I recounted how I began to read N.T. Wright’s books as a seminarian at Westminster Theological Seminary, and how this experience opened my eyes and heart to the Catholic Church. Wright answered that his theology does not necessarily lead to Catholicism. Trevin Wax recently published N.T. Wright’s full response here. Question: You seem to indicate here that Saint Paul does in fact teach the “Roman Catholic notion of infused righteousness.” How would we be wrong if we were to assume that you are here denying justification by imputation and favoring “a Roman Catholic notion of infused righteousness”? Question: Should we conclude that you agree with Trent regarding syngergism and disagree with Luther and Calvin on monergism? Question: Are you not affirming with Session Six of the Council of Trent that our justification (with it’s future implications) will be on the basis of works? John Piper doesn’t want to let you off the hook on this one. 4. Bishop Wright, in What Saint Paul Really Said (page 119) you wrote that justification is about ecclesiology before soteriology. This lines up nicely with Session Six of the Council of Trent (especially Chapter Seven) which relates justification in the traditional terms of catechumens and the Church. Question: How is your teaching in What Saint Paul Really Said substantially different from the Council of Trent’s formulation? 5. Bishop Wright, you note that Heinrich Schlier was a fine New Testament scholar. In fact, Schlier states that it was Sacred Scripture that lead him into the Catholic Church. Question: Do you believe that Schlier was so naïve as to believe that being Bultmannian or being Catholic were the only two options available to him? 6. Bishop Wright, you state the Council of Trent provided the wrong answer regarding “nature/grace question.” As far as I can tell, Trent only touched upon this question in Session Five and even there the word “nature” only appears twice. Question: Could you clarify what you mean by “Trent gave the wrong answer, at a deep level, to the nature/grace question”? To which session would I turn in the Council of Trent to find the alleged “wrong answer”? 7. Bishop Wright, you state that Trent’s “wrong answer to the nature/grace question” led to Catholic abuses in Marian doctrine and devotion. Question: Are you referring to something as general as the prayers to Mary or something more specific like her bodily assumption into Heaven? It is rather noteworthy that the two greatest saints of the Catholic Church are the Blessed Virgin Mary (a woman) and Saint Joseph (a layman). Our profound love for the Blessed Virgin Mary and her role in the incarnation goes without mentioning. Moreover, the Catholic Church venerates three female Doctors of the Church (St Teresa of Avila, St Catherine of Sienna, and St Therese of Lisieux) who stand next to the other great Doctors of the Church like St Augustine, St Basil, St Thomas Aquinas, et al. Question: Could you be more specific as to how the Catholic Church devalues the role of women and laymen? 9. You write that the Reformed, Anglican, charismatic, and emergent traditions can encompass the best of what it means to be “sacramental, transformational, communal, eschatological.” Yet, these four traditions (Reformed, Anglican, charismatic, and emergent) are in fundamental disagreement over what a sacrament is, how a human is justified and/or sanctified, what the church is, and what the eschaton is and how it will occur. Even within their own jurisdictions (e.g. Anglican Communion), there is vast disagreement over all of these issues. You say there are “bits of it” in the emergent church, but we could also say that there are “bits of it” when I pray the Our Father with my children before they fall asleep – yet “bits of it” do not entail the climax of the covenant as anticipated in Isaiah, Daniel, or the Minor Prophets. On the contrary, since the Reformation, only the Catholic Church has continued to hold councils and examine the deposit of faith. Lutherans, Anglicans, and Calvinists still appeal to the same dusty articles of faith that they drafted in the sixteenth and seventeenth centuries. They do not hold doctrinal councils. They are unable to reform. They are what they are. So the accusation that the Catholic Church doesn’t clean house is actually more appropriately directed toward Protestant denominations. Question: Is it the case that Protestant theology is clean and tidy when compared to Catholic theology? I am sorry to think that there are people out there whose Protestantism has been so barren that they never found out about sacraments, transformation, community or eschatology. Clearly this person [that’s me, Taylor] needed a change. But to jump to Rome for that reason is very odd. I would like to point out that I am not simply an isolated “this person” who “needed a change.” It’s quite ironic that Wright should says this the wake of the Pope’s announcement of the new Anglican Personal Ordinariates. I’m not the only one. Thousands and thousands of clergy and laity from his own denomination have appealed to the Pope as a result of the Anglican Communion losing its sacramental and communal nature. If Anglicanism can provide a Christianity that is “sacramental, transformational, communal, and eschatological,” then why are these Anglicans so deeply dissatisfied with Anglicanism? Would Wright also say that their “jump to Rome” is “very odd”? Thank you for reading. As a grateful fan and reader of N.T. Wright’s books, I am continually amazed by his profound insights into Sacred Scripture. As a Catholic, I continue to enjoy his books and find myself returning to his works on a regular basis. I have the highest regard for Bishop Wright and wish him all the best. I’d like to open up the comments and ask for responses. Would you agree that within Wright’s writings and public comments, “there are some things in them hard to understand”? What are we to make those passages that allege to be “not magisterially Protestant” but “not magisterially Catholic” either? 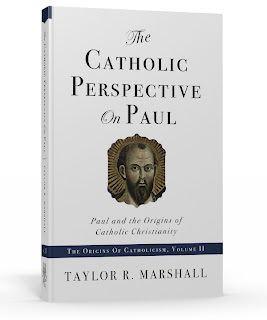 Please look for my new book: The Catholic Perspective on Paul (Summer 2010). It is based on the conviction that the Pauline epistles contain the primitive and pristine doctrines of the Catholic Faith (that is, the Patristic “old perspective” on Paul). In the Pauline corpus we discover a Paul who is Catholic, a theologian who is sacramental, a churchman who is hierarchical, a mystic who is orthodox. Listen to Episode #1: RABBI SAUL BECOMES APOSTLE PAUL. I’ll try to help and answer for Wright where I can. Q 1 is a misunderstanding, Wright does not seem to indicate that Paul teaches infused righteousness, instead it is very clear he is only arguing against Piper and the “objective genitive” in the phrase “the righteousness of God” in favor of his interpretation with the “subjective genitive” i.e. God’s covenant faithfulness instead of a gift called “the righteousness of God” that the believer receives. Wright is only teasing Piper and saying that if you insist on the objective genitive, you should rather be Catholic, because the verb is “to become” and not “to receive”. Both the Augustinian Catholic and the Protestant traditions have taken the genitive as objective. Q 3 confuses terms as well. Wright would not agree that works “increase our righteousness” as Trent says because for Wright righteousness is a legal status and not a moral quality of some sort. But yes, both Wright and Trent teach final justification based on works. However for Wright anyone who believes is assured of his final vindication as well, whereas for Trent one is not allowed to judge prematurely, the Lord searches the hearts. Q 4, well… The whole decree is basically quite an Old Perspective account on “how one is saved”. Sure, for a Catholic this takes place in the context of the Church. Baptism is THE KEY for understanding how justification is both about soteriology and ecclesiology. For Wright in WSPRS justification is about how one can know that one is a member of the covenant people of God. That is surely a different question from Trent. For Wright, anyone that believes in Christ is in the covenant family and assured of final justification. For Trent, one needs to hold to the view expressed in the decree itself in order to be justified. Wright is certainly the theologian who influenced me the most since conversion and he’s certainly pushed me away from evangelical fundamentalism and towards Catholic Theology. But I cannot go back to the Catholic Church, there is no way this institution or any other denomination except Jesus’ Kingdom Agenda gets my allegiance. Q1: Tom would certainly agree with the Protestants, against the Catholics that justification by faith is a status, a state of “rightness” before God. It’s a synonym for God accepting us as we are without merit and without infusing goodness into us. It’s basically forgiveness. Q2: I think Wright would say that justification by faith is all of God, all of grace but that the process of salvation towards ultimate rescue is certainly synergistic and our participation in Christ’s faithful way by the Holy Spirit. Q3: Wright is very explicit in his talks and books: Future Justification is definitely by works and it is Paul (and Jesus) who say this clearly. Q10: Wright would agree with you about Protestantism needing “spring cleaning” – it’s his key gripe with Piper, Carson et al. Overall, I feel that N.T. Wright supports what Pope Benedict XVI and Bartholomew, Ecumenical Patriarch of Constantinople, are looking for. That is that the body of Christ must be re-unified as one. So, I would not say that N.T. Wright is supporting the Council of Trent, but he is pointing out that the Protestant Christians are far too divided on issues that do not support Paul’s actual views. Obviously, there are less changes necessary amongst the Roman Catholic and Eastern Orthodox traditions, but I think N.T. Wright would argue that there are still changes that are needed to be made irregardless. However, he does seem to see a stronger need for much cleaning up and re-organizing of the Protestant denominations and that many attacks that are made on the Roman Catholic Church are unfounded. Post-Tridentine theology frequently talks about justification as a *status*, a state. Even in the vernacular languages, we talk about a state of grace. I know that this post is rather old; I just don’t understand the implications of Marc’s comment. All this sounds like hair splitting. I attended a conference many years ago where are the speakers were prominent theologians from Catholic and various Protestant churches discussing the primacy of Peter in the Church. Even though there were nuances of difference between them, the similarities were striking. I have often felt that the divisions in the church are far more emotional than intellectual, and that it is time to bring all the members of the churches together. Let the ecumenical councils iron all this out. Hi, I must say that Ten Questions for N.T. Wright regarding Catholicism, Justification, and the Church is a really very good location to slack from function I genuinely love your weblog and I’ve currently bookmarked it. Make sure you, keep it up-to-date more frequently. Thank you! Hello, I should say that Ten Questions for N.T. Wright regarding Catholicism, Justification, and the Church | The Catholic Perspective on Paul is often a really great location to slack from function I truly love your blog and I have currently bookmarked it. Make sure you, maintain it up-to-date more frequently. Many thanks! Great response to N.T. Wright. His name keeps coming around but I have hardly read any of his books. Appreciating the time and energy you put into your website and detailed information you provide. It’s great to come across a blog every once in a while that isn’t the same out of date rehashed material. Wonderful read! I’ve bookmarked your site and I’m adding your RSS feeds to my Google account. It’s very effortless to find out any matter on net as compared to books, as I found this piece of writing at this website. might look at Yahoo’s front page and watch how they write post titles to get viewers interested. That was pretty in details. I think that it would be great if you’ll share some links on those originals you’ve mentioned here. Hello it’s me, I am also visiting this web page daily, this website is truly nice and the viewers are actually sharing good thoughts. thanks for answering these important questions! I think it is important to follow the rules of the church! I like getting answers especially if you a lot of questions. Good for me to have found your site. Answers to such questions make it possible to understand those moments that until then were not completely understood by us. Thanks for raising these questions regarding Catholicism, Justification, and the Church. They are indeed vital! out of date rehashed information. Fantastic read! I’ve bookmarked your site and I’m adding your RSS feeds to my Google account.